Intel Quick Sync is beautiful and the future of streaming. Will Quick Sync will handle all the stream transcoding and free up the regular CPU / GPU? Answer: YES! - I got my Quick Sync working last night and my lawds it's amazing! I saw a 50% drop in cpu usage. This technology is going to be paramount for streaming computer and console games. - Install the latest intel HD graphics driver. - Quick Sync checkbox is now available! - Set the Intel HD Graphics 3000 as the primary card in OBS. - Set my x.264 preset to medium and below! - 720p @ 60FPS on my Aver Live Gamer HD and on my video settings in OBS. I start streaming and have a friend monitor my Twitch channel while we discuss on Skype.. I check my processor usage.... 10%... yes... TEN PERCENT! I'm streaming amazing quality video with minimal resource usage. This technology is going to literally flip my streaming experience upside down in terms of quality and an resource usage. Thank you for putting Quick Sync in OBS Palana! (and the rest of the team), thank you! Anyone else currently using OBS w/ Quick Sync and as blown away by this technology as me? edit: I wish I had archive enabled from my tests last night to review the video myself but I didn't enable it on my new test channel so no preview yet guys. Question: What is "Use custom x264 settings for QSV" ? Thank you Palana! You are some kind of genius wizard! I'm literally bouncing with excitement that this works so well. I just donated $5 to you guys, it's all I can afford right now but man I want to show how much you guys rock! Also, we are huge advocates of OBS over at http://reddit.com/r/twitch - I'm a moderator over there and we've been pouring a lot of time into the community. Would it be cool if we add the "Powered by OBS" logo to our sidebar? A few points of clarification before you get too excited :). Using Lucid Virtu is not recommended as it can result in compatibility problems and crashing. Setting your x264 preset will have no effect, since you aren't using x264. The "Use custom x264 settings for QSV" enables custom QSV parameters which you shouldn't need if everything is running properly. I did get one crash on the software last night during my testing but I assumed this was because I had my preset to set to slow. I assume this is the reason why its currently in test builds right now. I'm not using any Lucid Virtu software just the standard intel hg gpu drivers. I admit I don't fully understand the technology yet. I could still use quick sync without Lucid Virtu right? Thanks for the tip on the x.264 - I'll ignore that item for now if using Quick Sync and disable the QSV. Quick sync has been in stable builds for a while - make sure you aren't using an old test build. The new Iris Pro 5200 iGPU has some promise as it seems to have some good quality potential, but Sandy/Ivy QSV is actually far inferior quality wise to software x264 encoding. I have a i5 2500K with the Asus saberthooth P67, wich does not support Quick Sync.. I will go cry in a corner now. Yeah, its the motherboard. A more recent model should work fine, make sure it has a HDMI/DVI/VGA out if you replace the MB and you should be good to go. 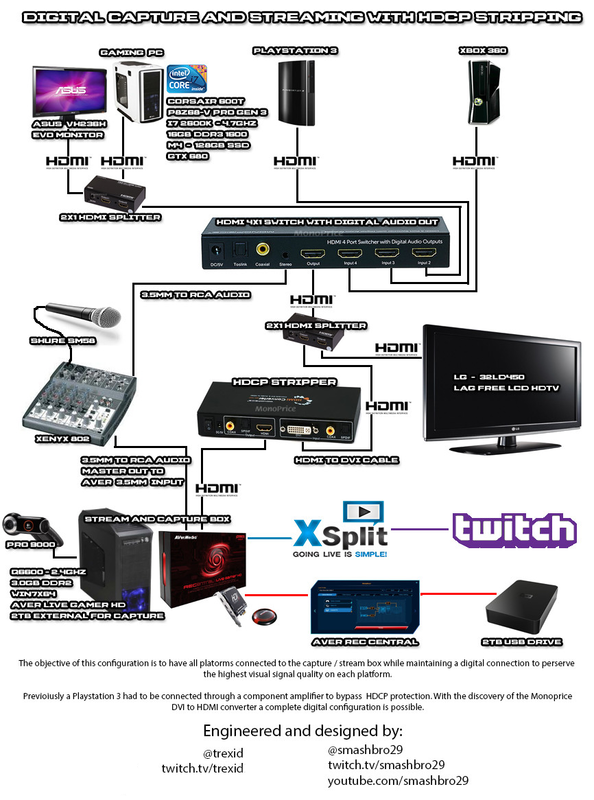 For Trexid: Are you streaming from a console or 2nd PC? Cause if not then I don't think you even need the capture card. I have a 2nd PC with an old Q6000 that I can max out but honestly, I'm seeing better performance from Quick Sync. I've yet to test PC gaming with Quick Sync but last night I was testing my PS3 through my Aver playing Ultimate Marvel 3. I also run my GTX 680 directly into my AVer card when I stream PC games too. I was under the impression that splitting my HDMI out of my GTX680 and plugging it into my Aver (which is installed in the same PC) and using that as the source is the best way to maximize performance. - remove the 2nd PC and place the AVer in my gaming PC and thats what I'm running right now. - I capture my PC and consoles all through the AVer. This helped me a lot to get Quick Sync running and it is amazing even when I use monitor capture, but I seem to be having troubles of getting it work with game capture at 0.583b at the moment. Does anyone else have such issues? Game capture and Quicksync are unrelated. You should make a new thread in Questions and Help and make sure you include a log. Threw some money at these guys myself for this feature. I've installed and followed this guide but now I have this ghost cursor in the top left corner of my main display. If I disable the VGA display from the guide then it goes away. How can I have it on but no ghost cursor? Hey Quick question, does this work with Ivy Bridge-E (2011 Socket) and/or SLI? I cant find any info on it? I have a question I have a i-5 4670 and was wondering if I would lose any visual quality when streaming switching to quick sync seeing as though i stream at a low bitrate. The E series processors do not have an iGPU, so QuickSync will not be available. As far as I know, SLI does not cause additional issues. QuickSync with low bitrates is generally not going to give you a great picture. Hardware encoders trade quality for performance, which means you generally need to use more bitrate than with x264. Except for Quicksync from Haswell CPUs / Intel HD Graphics 4600. Which is excellent even at low bit rates. Quality measured to be in the neighborhood of Faster, Fast, or even Medium x264 presets, which is better than the OBS defaults. That said, it depends on what is meant by "low bitrate". More is better, there's no getting around that.